MouseTrap is a challenging old-style puzzle game, involving you collecting fruit and avoiding the enemy red dots. The aim of the game is to eat as many of the white fruit pieces as you can possibly manage before dying. Your reaction times will tested to the limit! The enemy (red) balls are limitted in their movements - they are constrained to either move horizontally, vertically, or diagonally but they will not change their direction. 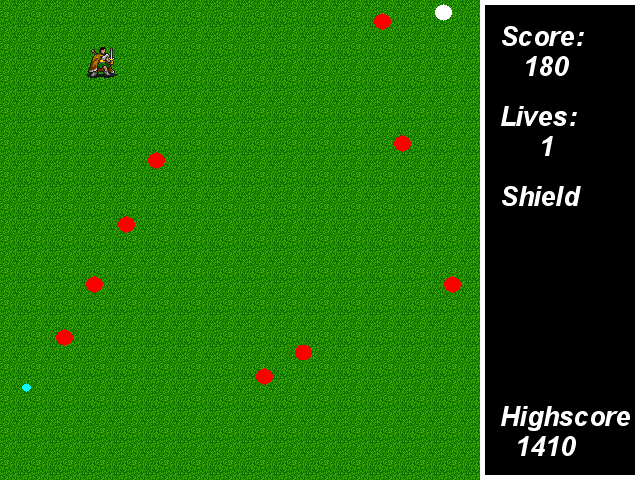 Dodging the enemy balls becomes very challenging once there are a lot on the screen at the same time. It requires as much thought as reaction speed. Use the arrow keys to move your avatar around, eating the white "fruit" and avoiding the red "enemies". If you eat a blue "fruit" you will gain a shield which will allow you to kill any of the enemies you bump into instead of dying yourself. 'q' == Quit & Exit. SEKINE Tatsuo also made an Fedora Core 4 RPM for the game, which is also available. Variable acceleration for the main player. Graphics could obviously be improved. libsdl-gfx is only used for the fast circle drawing code, so if they're replaced that means one less dependency. Thanks to Ryan Schultz for contributing a patch to make the red enemies have variable acceleration and diagonal movements.